South Sudan’s rebel chief Dr Riek Machar had finally returned to Juba. The Inter-Governmental Authority on Development (IGAD) confirmed Tuesday that Riek Machar will be a no-show at an upcoming high-level meeting aimed at revitalizing the August 2015 peace agreement in South Sudan. Despite Machar's absence, he will be represented at the meeting, according to IGAD's special envoy for South Sudan, Ismail Wais, who said that "his idea, his thinking, his position and everything he is thinking about will be represented." Wais said IGAD ministers have met with all the key stakeholders including estranged groups headed by exiled General Thomas Cirillo, former Western Equatoria state governor Joseph Bangasi Bakosoro, General Peter Gadet and former deputy chief of army staff General Bapinyi Monytuil. Wais described the meetings as "constructive and positive." He said the transitional government of national unity and other parties to the agreement have welcomed the revitalization process and IGAD's plans to include opposition groups. "They all agreed to a cease-fire, support of the revitalization forum and a realistic timeline, so this is a very important step we can build on," Wais said. The revitalization forum is an initiative spearheaded by the IGAD heads of state during a meeting held in July. IGAD leaders acknowledged the 2015 peace deal has not been implemented, and directed their council of ministers to initiate a resuscitation of the agreement. Wais said although his office is optimistic about resuscitating the agreement, the path ahead is thorny. "Never say will it be easy, but ... we are very determined to lead this country to peace," he said. Observers and other parties to the peace deal, including former detainees, have warned that without the full participation of Machar, a new round of talks likely will fail. 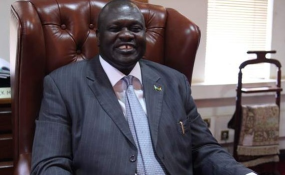 In an interview with VOA last week, John Luk Jok, spokesperson for the former detainees, pointed out that there are many South Sudanese in the bush still fighting for Machar. "The people who are shooting these days in parts of South Sudan claim to be loyal to Riek Machar and that, by itself, is not allowing the implementation of the cease-fire. The fact that he has people who think they are his supporters and who are armed, that constitutes a problem because you cannot wish that away," Jok said. IGAD is expected to convene the high-level revitalization forum sometime in December. Copyright © 2017 Voice of America. All rights reserved. Distributed by AllAfrica Global Media (allAfrica.com). To contact the copyright holder directly for corrections — or for permission to republish or make other authorized use of this material, click here.